The music of Leonard Bernstein has run as something of a thread through Marin Alsop’s recording career. During her time with the Bournemouth Symphony Orchestra she made a disc in 2003 that included Chichester Psalms and On the Waterfront (review). Two years later she followed that up with another Bernstein programme that included the Serenade (review). 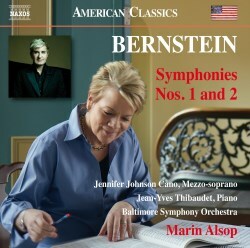 Bernstein recordings have continued since she took over the Baltimore Symphony. Her award winning 2008 recording of Mass (review) was followed by a disc that included a live 2012 recording of the Third Symphony Kaddish (review ~ review). Now her Bernstein symphony cycle has been completed with this CD, though I’m mildly surprised to see that the performances, both emanating from concerts, have been ‘in the can’ for some time. The origins of the Jeremiah Symphony lie in a setting for mezzo and orchestra of verses from the prophet’s Lamentations, which Bernstein made in 1939. Three years later he began work on a symphony and decided that the mezzo setting would function very well as its finale. He entered the score in a competition run by the New England Conservatory. Perhaps Bernstein’s score was judged too unconventional because, as Frank K DeWald relates in his useful notes, the prize was awarded to the Second Symphony by Gardner Read (1913-2005). Though you can find some biographical detail about Read online I rather suspect that this symphony – and in all probability the rest of his output – has now been largely forgotten. Notwithstanding the jury’s verdict Fritz Reiner invited Bernstein to conduct the premiere of his symphony with the Pittsburgh Symphony where Reiner was Music Director at the time. One is almost reminded by this story of Berlioz’s attempts to win the Prix de Rome. Bernstein's score was certainly not conventional and in all probability was judged to be out of court by a competition jury. As DeWald observes, it “flaunts the convention of the form”, as does its successor. The first of its three movements, ‘Prophecy’ is a big, powerful and strongly felt slow movement. Alsop and her orchestra deliver it with great intensity, building to a potent climax just after 5:00. I was put in mind of Copland and Roy Harris and also of Shostakovich. I don’t know how much Bernstein had been exposed to the latter’s music by this time though by 1948 he performed the Leningrad Symphony with the Boston Symphony. The second movement, ‘Profanation’ is a vital, driving scherzo. The music requires great energy to do it justice and that’s what the Baltimore Symphony supply here. They seem to revel in the complex and irregular rhythms. In the ‘Lamentation’ finale we hear mezzo Jennifer Johnson Cano. I liked her performance a lot; her singing is eloquent and heartfelt. Though she puts a great deal into the music I don’t think she ever overdoes the emotion. Alsop and her orchestra match their soloist’s intensity and the gentle, consoling instrumental conclusion is very well managed. This is a very fine reading of the symphony. If the First Symphony was unconventional, Bernstein was even less bound by traditional symphonic form in his Second. For one thing there’s an extremely prominent and virtuoso part for a solo piano. Even less conventional is the structure. The score is cast in two parts. Part I, which plays for 16:09 in this performance, consists of a short Prologue followed by a series of fourteen short variations, split into two groups of seven. The groups bear the titles ‘The Seven Ages’ and ‘The Seven Stages’ and Naxos give each variation a separate track, which is most helpful. Part II has three movements, entitled ‘The Dirge’, ‘The Masque’, and ’The Epilogue’. Bernstein’s inspiration was W.H. Auden’s long poem, The Age of Anxiety (1947). Described as a ‘baroque eclogue’, Auden’s poem is a series of conversations in which three men and a woman engage. Bernstein sought to translate into music the structure of Auden’s poem which deals with some of the neuroses of society at that time. Never having read Auden’s poem I can’t begin to judge how successful Bernstein was in executing what seems an ambitious undertaking. I can only judge the music I hear, which is shot through with brilliance and the exuberance of a young and outrageously talented musician. There’s certainly brilliance in the present performance of Part I. The tender, pensive clarinets which dominate the Prologue get matters off to a fine start and then Jean-Yves Thibaudet takes centre-stage in a spirited partnership with Marin Alsop. I relished, for example, his sparkling playing and the pithy orchestral contribution in Variation IV. A little later, Variation VII, which closes ‘The Seven Ages’, is beautifully hushed and delicate. The whacky waltz that is Variation IX is done with great zest and in the last three variations the excitement is ratcheted up incrementally. ‘The Dirge’ which opens Part II is a Largo. According to the notes Bernstein himself referred to “Brahmsian romanticism” in describing this movement. I have to say I don’t perceive the Brahms connection at all. In fact the music sounds pretty tortured to me – and highly effective. Thoughts of the traditional symphony get thrown out of the window in ‘The Masque’ which is marked Extremely fast. The movement is scored just for the solo piano, double bass, timpani and percussion. The booklet notes are right on the money in describing it as a “jazz frolic”. The performance is dazzling with Thibaudet offering marvellously athletic pianism and seemingly joined at the musical hip by his colleagues. After this, the concluding ‘Epilogue’, though marked L’istesso tempo, is broad and eloquent. Marin Alsop moulds it impressively. Bernstein revised the movement in 1965, giving a much more prominent role to the pianist. I’ve heard Bernstein’s own recordings of both symphonies in the past – he recorded them twice: once for CBS/Sony and then later for DG. Unfortunately I didn’t have copies of his recordings to hand for comparison but my memory of them is that while the composer, as ever, put his own special stamp on the music Marin Alsop need not fear the comparison. Incidentally, there is a live archive recording of Bernstein conducting the symphony in 1950 with Lukas Foss playing the piano (review). That performance immediately preceded their CBS studio recording. It’s not comparable with the Alsop recording, not least because of the archive sound, but, my goodness, Bernstein and Foss go like the wind in ‘The Masque’. Their performance is of the original version, which gave Foss very little to do in the ‘Epilogue’. As I said, I don’t believe Marin Alsop’s performances need fear comparison with the recordings by the composer himself. I’m not sure that these symphonies really have a secure place in the repertoire but they are rewarding scores and, like their composer, they are larger than life. It’s great to have Marin Alsop’s fine interpretations, splendidly played by the Baltimore Symphony and with the benefit of Jean-Yves Thibaudet’s superb pianism in ‘The Age of Anxiety’. The recorded sound is excellent. It’s punchy and immediate and with ample body, which is just what this music needs.